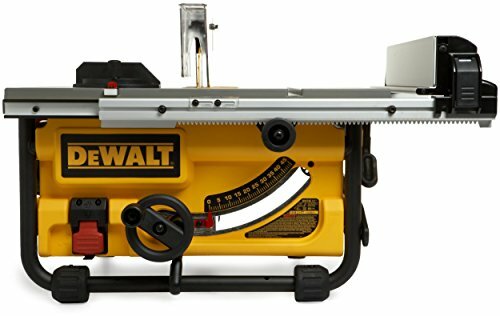 In terms of value, the Dewalt DW745 table saw stands out as one of the best portable table saws on the market and is used professionally by contractors everywhere in the world. While the DEWALT DW745 comes at a fraction of the cost of cabinet models, it appears these savings did not come at the expense of power, durability, or cutting precision. It is built sturdy and strong. It sits atop a solid metal roll cage base ensuring a firm stance while cutting. And at around 50 lbs, it is held fast with its own weight while remaining easily portable while still perfectly suited for most small to medium projects. This becomes quite apparent when taking into account the Table Saw’s ability to cut through hard woods with ease–a feat accomplished with the help of a 15 amp, high-torque motor. Quick and simple setup also avoids frustration out of the box. Plus the included Carbide blade makes it even more immediately usable. It is good to see a manufacturer include a quality saw blade with their product thereby saving the user for another purchase just to have the table saw work as described. One of the key features driving the success of this table saw is its unique fence design with the rack and pinion. One user mentioned that the store model he saw was loose after years in the store but we can’t be sure whether that is due to the design itself or the inherent abuse a store model receives. Several users upgrading from a Skilsaw brand or Makita were particularly shocked by the phenomenal difference in cutting quality. The included miter gauge does make beautiful cuts, however, if metering is your main use then you might consider an alternate saw design altogether such as the DEWALT DWS780 12-Inch Double Bevel Sliding Compound Miter Saw. The DEWALT DW745′s rip capacity is another limiting factor that isn’t usually an issue if you aren’t cutting tons of sheet materials. If the rip capacity is an issue you might look to Bosch 4100-09. The most frustrated reviewer indicates that he only got three years to use from the saw and mentions other little annoyances, however most of those issues seem addressed by the strongest positive review showing how you can convert this moderately priced table saw into one that cuts as well as a $2,000+ hybrid table saw and holds up to beat. Of course, if you wanted to upgrade from the start you could go with the previously mentioned Bosch 4100-09, to begin with. The consumer reviews are available on Amazon. This DEWALT product comes with an excellent 90-day money back guarantee, a three-year limited warranty, and even a one-year free service contract for additional peace of mind. Few other table saws offer the same kind of quality or power as the Dewalt DW745 does for the price. Its 10-inch blade provides more than enough cutting depth for most project needs. Plus its small footprint comes as a surprise considering the power that it commands. while it can be stored on a 24-inch shelf or hung from a hook in a work van, it still has enough oomph to cut through hardwood. In the end, the ease of portability of this saw, along with the solid performance and fast set-up makes it a standout favorite. If you’re looking for the best possible experience and precision you can get from an affordable bench wood saw, DW745 just might be your perfect solution. Whenever we go for purchasing any product especially big products like a table saw, first of all, we have to check about the brand name, brand image, how old company is, product range, features & reviews of customers about products. Dewalt is a well-known brand in table saws. In 1922 Mr. Raymond E.
Dewalt made the first radial arm machine. Dewalt was formed in 1924 in Pennsylvania. From the day of formation, the company grew quickly. The company makes a wide range of products that are used in woodworking. In 1960 Dewalt became part of Black & Decker. Black & Decker is also called a worldwide leader in the manufacturing of power tools. Now we know that Dewalt is a very old company in woodworking. Because of its experience of more than 90 years the company makes very good quality products. Dewalt makes table saws with large ripping capacity. The company is also making the table saw models up to 32.5-inch ripping capacity which is much higher than other table saws. So for cutting large wood pieces, Dewalt is preferred. 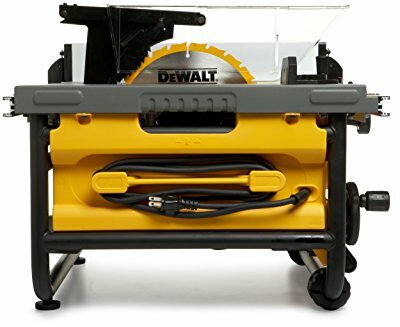 Dewalt table saws are easy to transport as compared to other companies. Dewalt table saws come with a rolling stand, Scissor Stand & the models without stand also can be easily carried from one place to another. In a table saw generally there is a problem faced by most of the people is of storing accessories of a table saw. Dewalt saws often come with large onboard storage space, which helps a user to store accessories like a fence, riving knife, guard etc. Generally, most woodworkers while working often forget to use a guard. This is a very big problem which can cause any miss happening. Dewalt includes unique guard detect system in high-end models. This system gives warning whenever we go for the cut without proper fitting of a guard. One separate activate switch is also provided that allows the user to work without the guard.